A clip from ‘Budrus’, a film financed with a grant from the UJA-Federation in New York. 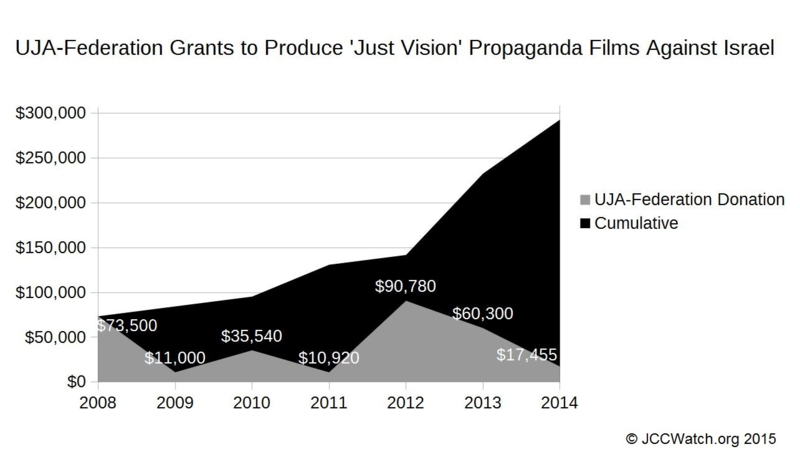 The UJA-Federation of New York continues to astonish with another revelation from their grant-making, showing $300,000 to support a slate of propaganda films distributed internationally to undermine the Israeli government. The annual donations were made via its wholly-owned Jewish Communal Fund subsidiary. The grants, ranging from $11,000 to $90,780 over the past seven years, have allowed ‘Just Visions’ to produce three films used as fodder for those groups calling for boycotting, divesting and sanctioning Israel. On university campuses across our country, these films, financed with Jewish funds from the UJA-Federation, are being used to torment Jewish students trying to get an education at school. The films include, Budrus (2009), that makes the case against Israel for building the separation wall to end the years of suicide bombings and sniper fire directed at their civilian population. The impact of the film devastating to Jewish causes and was screened at many film festivals with the audiences leaving with a hatred for Israel. The boards of the UJA-Federation and its Jewish Communal Fund subsidiary say they stand by a code of conduct for its grants, however, this $300,000 spent over the past seven years shows, once again, that they have not lived up to their own guidelines. JCCWatch.org Investigative Unit includes an all-volunteer team of accountants, lawyers, investigators and activists who work to unmask the covert support for those in Jewish communal organizations who would boycott, divest or sanction Israel, using our own donations and institutions against the Jewish people. Call to Action: Watch this short trailer for the ‘Just Visions’ propaganda film Budros, and decide if this is the best way for the UJA-Federation to support our Jewish families in Israel, then call them (212-980-1000) to tell President Alisa Doctoroff and CEO Eric Goldstein what you think. Unbelievable…. Too bad the kapos at UJA-Fed couldn’t bother to donate $300k to a film that might say something nice about us…. OMG, this is a shonda. Shame on the Federation. UJA and Jewish Federations of America are vain and vapid rich fat cats who pander to the public sentiment of the day. And whatever the administration says. Total appeasers and kiss ups. Kahane was right, the Federation did nothing when Jews were hauled off to camps and burned in ovens. Nothing. They were afraid to voice their outrage, concerned about how they would be perceived by American society. Their vanity was at stake. Knowing what I know about them and their donor money which goes to support Palestinian causes, I would not walk into their buildings which are walking distance—– no matter how nice the JCC on the campus is. And not a cent of my money will they ever get. I prefer to give it to NO KILL animal shelters. P.S JCC WATCH-I confronted our director CEO of the local Federation re OTI years ago, with others- they still fund them. He wont look me in the eye. Do you need volunteers in the org ? ?